Hey green beauty lovers in Singapore! Look at what we have in our market now! 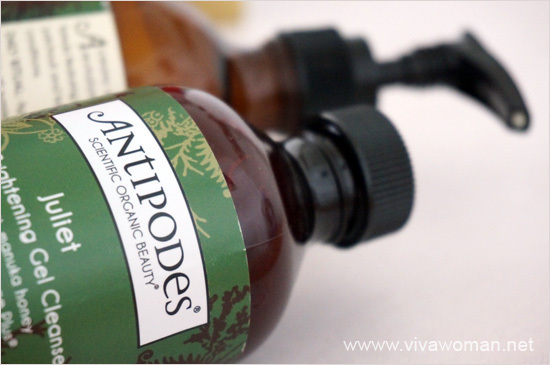 Itâ€™s Antipodes, an organic beauty brand from New Zealand! I donâ€™t know about you ladies but Iâ€™m really excited that this brand has finally graced our shores. I was disappointed that theyâ€™d dropped me to run a review for them some years ago when they learned that I’m based in Singapore. But hallelujah, I’m finally reviewing the products now that they’re here–better late than never! So why am I so excited about this brand? Well, weâ€™re not just talking about a natural brand with cleaner ingredients. Weâ€™re talking about an organic beauty brand backed by science to deliver validated results. 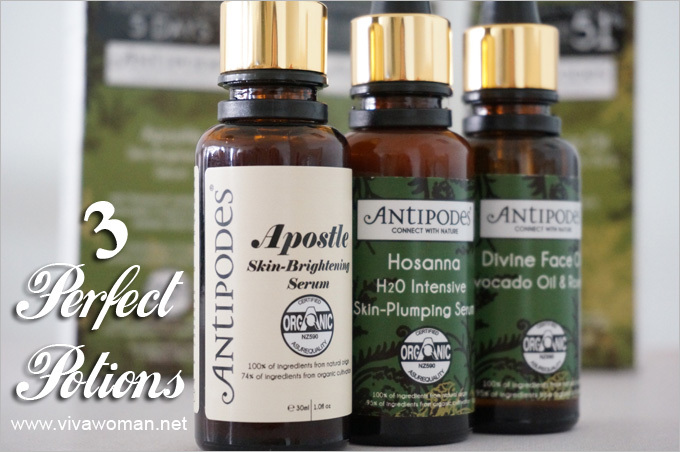 Green beauty purists would be pleased to know that most of Antipodesâ€™ products are certified organic by the independent government body AsureQuality Ltd, the leading provider of food safety and biosecurity services in the southern hemisphere. In addition, Antipodes believes in science and has invested into research and development with top experts to create high-performance anti-aging products. Now that’s a potent combination of science plus nature guaranteed to deliver some visible results! 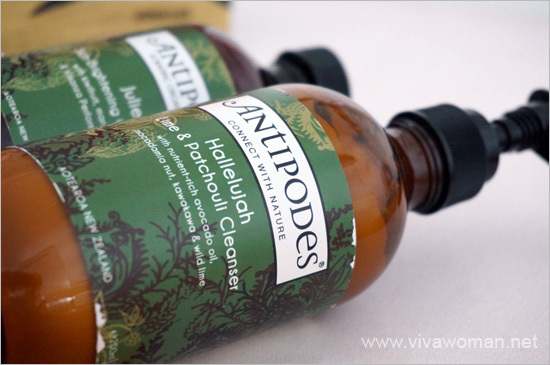 The distributor who brought in Antipodes had sent me a couple of products for review and today, I’ll share with you about two of their popular cleansers. Aqua (water), glycerin, persea gratissima (avocado oil), macadamia ternofolia (macadamia oil), buxus chinensis (jojoba oil), wheat straw glycosides, cetearyl alcohol, daucus carota sativa (carrot oil), macropiper excelsum (kawakawa leaf), citrus nobilis (mandarin oil), citrus limetta (lime oil), pogostemon cablin (patchouli oil), tocopherol (vitamin e), gluconolactone, sodium benzoate, calcium gluconate, citrus grandis (grapefruit seed extract), d-limonene*, linalool*, citral*. * Componant of essential oil. I’m an avid user of creamy cleanser–I use them in the mornings and also to remove my makeup. This category of cleansers is the gentlest for my skin but I have to admit they don’t cleanse that well with just one wash. Typically with creamy cleansers, you would have to use a second wash or perhaps an extra aid like a muslin cloth to ensure all impurities are properly cleansed. Some people have also said they dislike how cream cleansers leave their skin with a somewhat sticky film. So I was totally expecting the Antipodes Hallelujah Lime and Patchouli Cleanser to behave like a typical cream cleanserâ€”nothing extraordinary. But boy I was wrong for this product exceeds my expectations on all front! It is so creamy, smells so refreshing and most of all, cleanses my skin really well in a single wash. I did an experiment by using Le Mieux Skin Perfecter after washing my face with this creamy cleanser and the tool didn’t pick up too much residue except from the nose area. This is a creamy cleanser that doesn’t make you feel like you didn’t wash your face clean enough. Yet, it doesn’t dry out your skin, leaving it taut and tight. What can I say? Hallelujah! Two thumbs up! This is their most popular cleanser and I can see why. It is a gel cleanser that lathers up with good amount of foam, and contains exfoliating extracts from the New Zealand kiwi superfruit and vibrant hibiscus flower. Other ingredients include manuka honey with antibacterial properties, antioxidant-packed vinanza grape which help reduce and balance oil production. It is also lightly scented with refreshing green apple and cardamon. And the result? It smells very sweet like childrenâ€™s candy. In fact, it reminds me of the cherry candy I often eat from Yummy Earth. Aqua, herbal extract mixture of vitis vinifera & actindia chinensis (Vinanza Performance Plus sauvignon blanc grape seed & Kiwi fruit pulp), sodium cocoyl glutamate, sodium lauroamphoacetate, wheat germamidopropyldimonium, hydroxypropyl hydrolysed wheat protein, sodium hydroxymethyl glycinate, persea gratissima (avocado) oil, buxus chinensis (jojoba) oil, leptospermum scoparium mel (manuka honey), hibiscus sabdariffa (hibiscus) flower extract, sodium benzoate, gluconolactone, calcium gluconate, essential oil fragrances of green apple & cardamon: benzyl alcohol*, cinnamal*, citral*, citronellol*, geraniol*, limonene*, linalool*. * Component of essential oil. I use this cleanser once a day in my double cleansing, right after using the Antipodes Hallelujah Lime and Patchouli Cleanser. It a bit too sweet smelling for my liking but otherwise, it is an effective cleanser. I’m only in my second week of using this cleanser so it’s too premature to talk about the effects of brightening. I do like it but between the two, I prefer Antipodes Hallelujah Lime and Patchouli Cleanser. 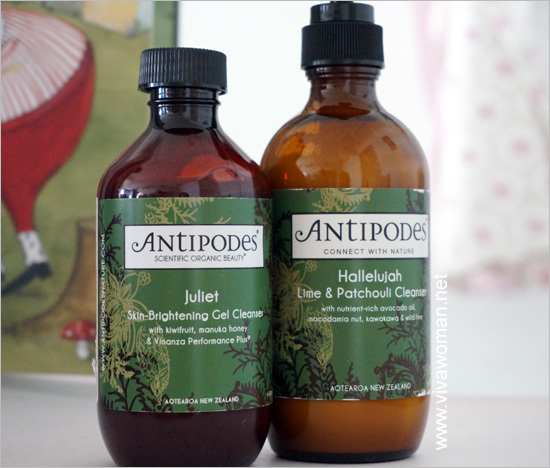 The reason I prefer Antipodes Hallelujah Lime and Patchouli Cleanser over Antipodes Juliet Skin-Brightening Gel Cleanser is purely due to personal preferences and has nothing to do with their efficacy for both make effective cleansers. 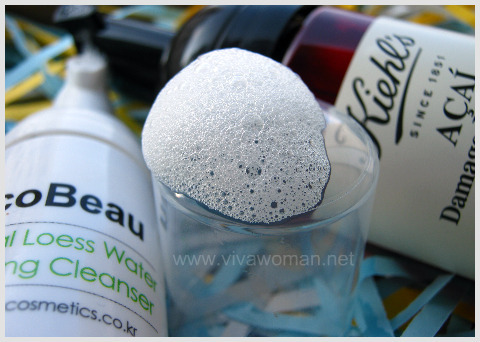 Both cleanses efficiently and you do not have to use too much of the product to achieve cleaner skin. However I like that Antipodes Hallelujah Lime and Patchouli Cleanser comes in a pump glass bottle and smells just right. 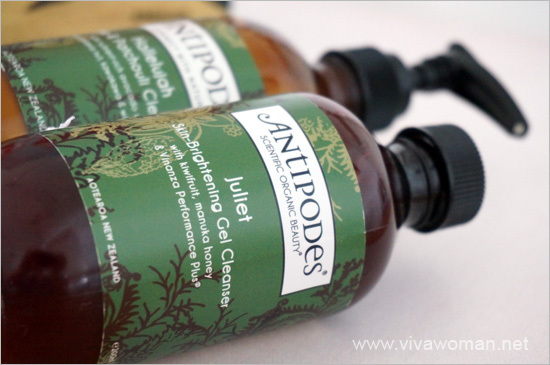 Whereas Antipodes Juliet Skin-Brightening Gel Cleanser is too sweet smelling and comes in a plastic bottle without a pump but a screw top. I had to squeeze the gel from the bottle and itâ€™s a wee bit troublesome if you ask me. I wonder why it does not come in a pump bottle or a tube? You can get Antipodes online via Skintegral or Bud Cosmetics. 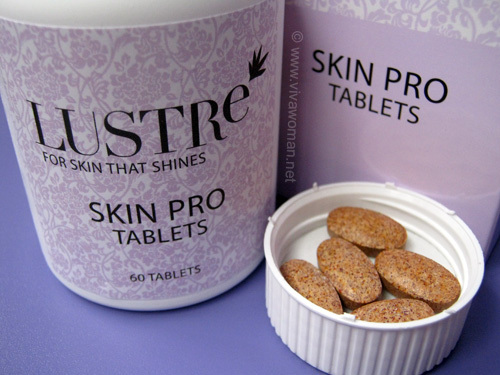 The prices are mid range but I personally find them reasonable for the quality formulation. I’ll be reviewing three more products in another few weeks’ time. Perhaps by then, I can run a quick review if the Antipodes Juliet Skin-Brightening Gel Cleanser has any whitening effects for me. thanks for sharing your review. I drop by your website now and then and really appreciate what you have shared. 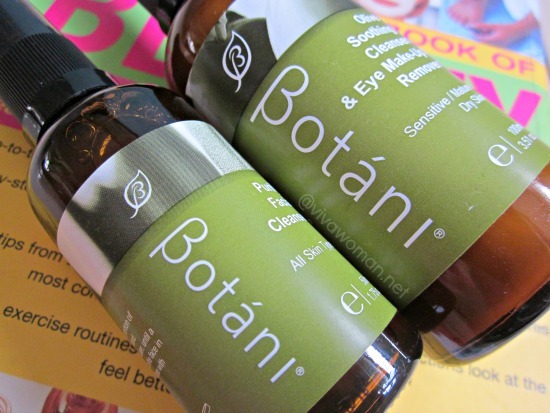 Because of this blog I have switched to organic skin care and have never looked back. thank you again, and keep up your great work. Ahhh finally a superb review of a new cleanser!I’m bored of using Sukin for the longest time now. Hehe shall give both a try soon after im done with the Sukin gel cleanser & Acure creamy ones. I totally understand what you mean by getting bored. I was so bored with Sukin the last time too, after using a couple of bottles. Does the hallelujah cleanser clog pores? No, it shouldn’t going by the ingredient list. Plus, you’ll wash the cleanser off your face. I love Antipodes & it’s great to know it’s finally in Singapore 🙂 I actually like the Juliet cleanser a lot although I won’t attest to any brightening effects. I have run out but am planning to try the Lime & Patchouli one so it’s good to know that it works well! Yeah, the Hallelujah cleanser is great! As for brightening effects, can’t tell. Hopefully it does something along with the Apostle serum I’m currently using. Ahh.. my favourates. 😉 You should try their manuka honey mask. Very well reviewed Sesame 🙂 I love cleansers like these! I am thinking to try the Lime and Patchouli one! Sesame Very well cleansers like these! Hi Sesame – thanks for sharing! I got my hands on a bottle of the Lime & Patchouli today! Just want to check on the correct method of application, because this is my first time using a cream cleanser. Should I be applying it to my damp/ dry face? You should apply it to your damp face and massage through. If you’ve makeup on, you’ll need to double cleanse to get rid of the makeup and impurities. If you use it in the morning, you only need a little. Hope you’ll like it.